Victorius, a Roman general famous for his wit and courage, falls in love with Caesar's daughter and wants to marry her...but it is not as easy as it seems! 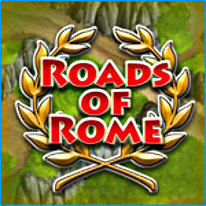 Caesar sends Victorius miles away to build a wide net of roads across the barbarian lands. Prepare for a journey full of adventures! Each level has a small set of goals: to construct certain buildings, to explore new territories, and to build roads! Take note of these instructions and spend your money, resources and time carefully to accomplish each task. Found new towns, and expand Roman influence and power! Once you get started, it will be hard to stop!